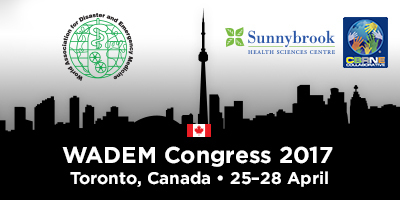 Below are the slide decks (as PDFs) from several of the Special Sessions that occurred at the Congress in Toronto in April. Many of the sessions were the result of the Track Team concept utilized for the first time at a WADEM Congress. Most took place in the early morning, late afternoon, or over the lunch hour. Thank you for supporting these inaugural sessions! Johan von Schreeb Is There a Role for University-based Research to Improve EMT Disaster Response?